I was wondering if anyone had assembled their PB from scratch. I just came across the PBBP on Flight's site, and felt like I was up to the challenge. Also thinking Pro-Modular for the face plate. Any Suggestions? Any Pros/Cons? Very easy to build. As long as you can soldier jacks. Maybe do a double......Go for it. Do it! Flight's BB Kit is super easy, as the PCB is pre-stuffed. You just need to wire it up. You are exactly the kind of person I designed the Barebones Packs for. 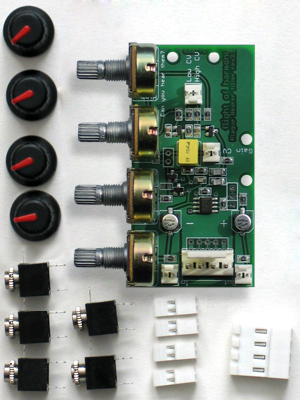 The PBBP includes everything in the picture below, all you need to supply is a power source and some 24-gauge wire. Customization is also perfectly OK - different knob colors, pots loose with headers on the PCB, extra jacks, different jacks, and also a different power connector. The PCB has holes for both of the common connectors styles so a Doepfer-style header is no problem, and I can provide a Doepfer-style power cable as well. The PCB has holes for both of the common connectors styles so a Doepfer-style header is no problem, and I can provide a Doepfer-style power cable as well. Thanks for answering the question flight! Good to know the people that run these companies are as badass as their Modules! Expect an order ASAP. Just used some spare plastic around the house for the Face plate and purty paints to decorate. It looks like a novelty cake. Good job! Now you need 1 more for total mayhem! I love it! Good work man. Just ordered 2 of these, planning on doing a double faceplate. Can't wait! Someone suggested sticking a barebones PB or two in there and I'm seriously considering it. One thing I'm unsure about is how to secure the PCB so it's not just flopping around behind the panel, since I'd have to go with the unattached pots option. Any ideas? It looks like the pots are threaded. Would a thin bolt on the inside of the panel and then another one on the outside (with a small bit of torque) provide enough stability? There are 4 pots, it's seems like it would hold very well. Just mount the jacks seprately on the panel. Have not tried this before though. I don't quite get what you're saying about the "thin bolts". I agree that the 4 pots should hold the PCB fine, but the holes in that panel are not spaced the same as the mounted pots, so I'd have to go with the detached version of the kit. Please forgive me, I meant "nut". Drill holes in the panel that are spaced for the pot's. Thread a thin nut onto each pot, trying to keep them level to eachother (a lock washer might not be a bad addition if you move the rack often, it goes between the panel and the nut). Push the pot necks through the panel holes (from the rear of the panel), thread a nut to the front of each of the pots and tighten a bit (lock washer potential here too). Hope that came out right. I am going to order a couple of these kits shortly, the price cannot be passed up and would be a fun side project. making a faceplate now, cant wait to put it all together. Could anyone tell me the exact distance between the pots on the PB by any chance? then I can drill the holes n everything so its all ready to go by the time it turns up in the mail... and yes i'm excited. It's on the barebones page on FOH site. sweet, dont know how i missed that! no problem. that will make it a bit easier. @ terrafractyl: FYI: They're spaced 0.75" apart. awesome little module, i kinda knew I was going to need another one..... Confirmed! On the website it says "The PBBP contains just enough components to provide full functionality, no extras or Ã¢â‚¬Å“frillsÃ¢â‚¬Â." So... are there anything youÃ‚Â´d miss by getting the barebone pack instead of the ordinary PB? It doesn't include the extra four jacks in the multiples (High, Low, Gain, Input).